Alternative history, Manila is not declared an "Open City", January 1942; instead the USAFFE makes a "Stalingrad" style defense of the whole city. If there was any positive contribution the Macabebe Scouts have in Philippine History, it was their role in finally putting an end to Emilio Aguinaldo's grossly incompetent and criminally wasteful leadership; a doltish and wishy-washy type of leadership which was the single most damaging factor to the cause of Philippine independent nationhood. Another thing is, contrary to popular belief, the war did not end with Aguinaldo's capture. His surrender was his humiliation alone, and not of the Filipino nation's. The struggle went on for several more valiant years in a much more pure and holy form, a form for which we can truly relate to and reflect without shame. IN THE END, ONLY THE PURE OF HEART CAN REDEEM A NATION! Very Creative and colorful works Ray! Thanks Philip, I wanted to use the "Punit the Bandila" poster and plaster it next to the "Alhambra" cigar ad on the wall but i can't find it. Will you e-mail it to me so i can try to use it? And here is the original "before" photo of Sta. Cruz church in pre-war Manila. You are great my man doing all that photoshop. Nice. I like the khaki-clad officer types plus blue-clad enlisted type/grunt mix. Thanks Y'all. I'd love to try doing a P.S. cavalry one next time but I need shots of you gentlemen riding horses, or at least riding a saddle swishing swords and all that. 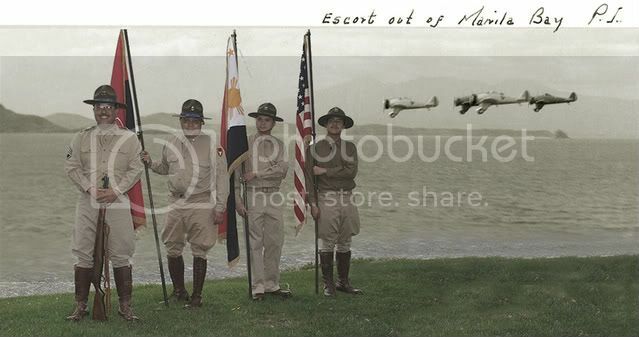 January 11, 1942, Mabatang-Abucay sector, Bataan Peninsula, P.
the 57th Guarding the east Road on the bay side. Commanded by 2nd Lt. Alexander Nininger, was the first American to received the highest award posthumously the Medal of Honor in the Philippine Theater. “Fighting was terrific and bloody in the Abucay area. There was much hand to hand combat. The highest tribute I can pay to the PS, who were officered by Americans and had been trained in prewar years as a part of the American Army, is that I have never seen nor do I ever expect to see, any better or braver soldiers than the Scouts. They were truly an inspiration… casualties in the Scouts were high, but their determination and bravery was unsurpassed…. All during the day, many wounded Scouts were brought to the rear. Not once did I hear one whimper of pain or an utterance of complaint… "
As of May 1. 1942, the US Army had awarded fourteen DSC medals to Philippine Scouts, in addition to the Medal of Honor to Calugas. Nice transformation. Good job Philip. Pic of the week next? Yes go ahead! ;D This was a lot of assembling and making it all work as one shot. 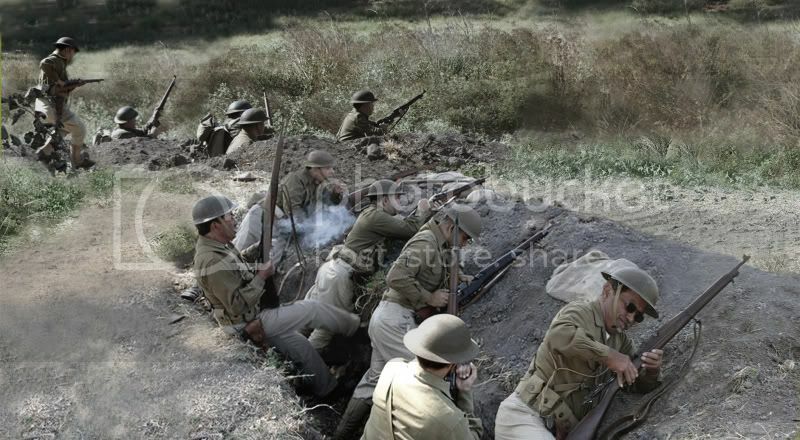 I like that their are 2 of you next to my 2 in the trench.